If you have young kids or even quite a few dogs, then bike trailers can be very useful for you. This is because you won’t have to worry about your children on their kids’ bikes while you’re cycling, or the dogs running in a different direction. This is because they will actually be attached to your bike on a trailer just behind you. This product can make your life a hell of a lot easier because you won’t have to be forever checking on them and you won’t have to slow down to stick to their speed as well. So trust us you won’t regret purchasing one of these. Therefore we’ve put a list together of some of the best bike trailers that are on the internet. This bike trailer is actually available in two seats or one seat, which is a very useful feature. It’s also universal, which means that it is able to fit on any bike that you desire it to. It comes with a 5 point safety harness and a safety flag to provide you with extra visibility. It is suitable to be used in any type of weather conditions, as it is waterproof and it also has a bug screen at the front to stop any insects from being able to fly in. There is also a storage area at the back of the trailer too. Why We Liked It – This bike trailer is universal and it can also be collapsed down and will easily fit in a car or a storage closet. This bike trailer actually comes in a small variety of colors, so if you want it to match your bike, then you can easily do this. It comes with 16-inch pneumatic tires and molded rims, which will increase the performance and the style of the bike trailer. It has a folding frame design, which means that it won’t take up much space at all. It has a two in one canopy that includes a bug screen as well as a weather shield, so it’s suitable for most types of weather conditions. 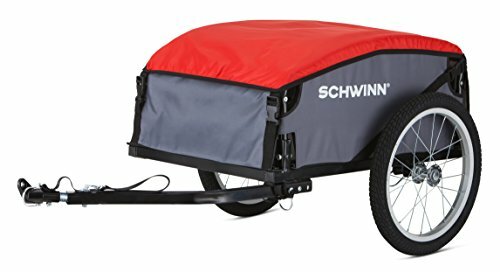 The maximum weight for this bike trailer is 40 pounds, and it comes in an option of one seat or two seats. Why We Liked It – We liked this product because it actually has quite a large maximum weight. This bike trailer actually has two different modes you can either use it to tow while you’re riding your bike, or you can use it as a stroller and push it along. This can be very useful if you want to visit places while you’re riding your bike, as you won’t have to worry about not taking everything with you. It has 16-inch pneumatic tires with molded rims, this makes it very safe and increases the performance of it too. It has a five-point harness to make sure that anyone who is inside is protected. It’s very easy to assemble and has a folding frame design. Why We Liked It – This bike trailer is easy to assemble and is able to attach to any style of bike, which is a very handy feature. 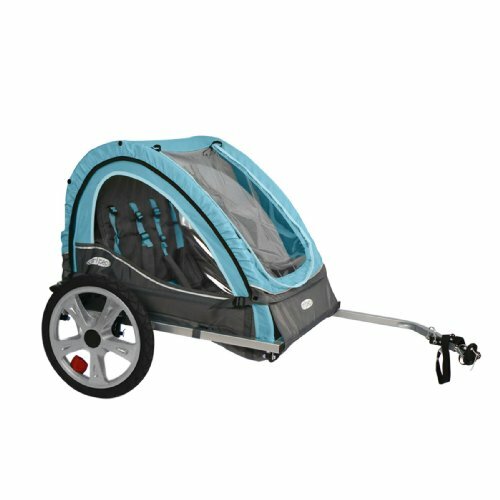 If you’re on the hunt for a bike trailer that is available in quite a few colors, then this is ideal for you. It’s also very lightweight, so you won’t even feel that it’s attached to the back of your bike. It has rug steel wheels that will provide you with extra grip whatever surface you decide to ride your bike on. It comes with a foot guard tube that is able to protect your children’s feet. It has a safety harness and a safety flag to ensure that there is complete protection while it’s in use. It has a folding design, which makes it very easy to store and easy if you want to transport it around at all. Why We Liked It – This product is very safe to use and it is also very easy to store in any location too, as it has a foldaway feature. This bike trailer holds one child and has a max weight of 40 pounds, plus, one very useful thing about this bike trailer is that it has additional 12-pound storage at the rear of it. This means that you don’t have to carry anything on your back while you’re cycling. 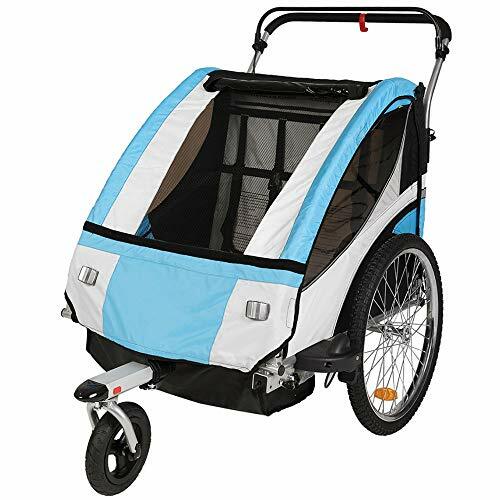 It has a unique folding frame and quick release wheels, which makes it very ideal for storage and transportation. It has a universal coupler, which makes it very easy to attach to any type of bike that you may have and it’s very easy to install as well. 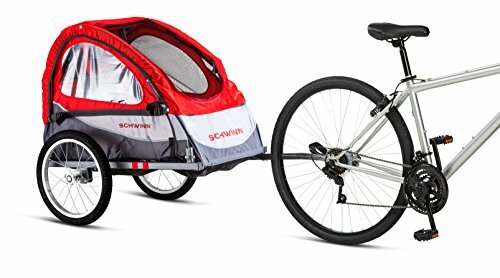 Why We Liked It – This bike trailer is easy to install and has a two in one canopy to protect your children from bugs and the wind. If you need to take quite a lot of stuff with you that you won’t be able to carry in a backpack, then this cargo trailer will be great for you. It has a very wide frame that is able to provide you with large storage capacity. It has a folding frame design and quick release wheels, which makes it very easy to pack away and very useful as you can easily store it anywhere without it taking up too much room. This bike trailer is also able to attach to most bikes as it has a universal coupler. It comes with 16-inch air filled tires that also have molded rims, and they actually provide you with a very smooth ride. Why We Liked It – We liked this product because it also comes with interior D rings that strap down your cargo to make it more secure. 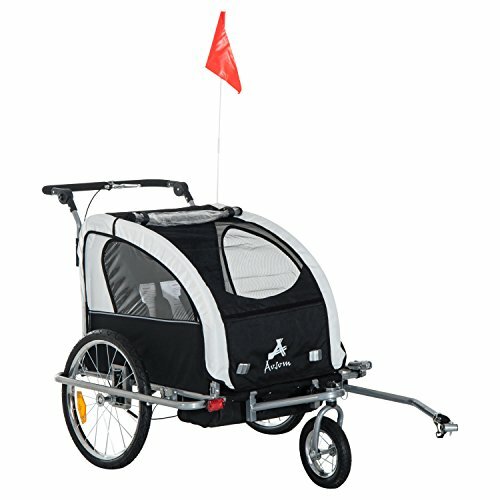 This bike trailer actually has a three in one design, which is very useful, as it can become a bike trailer, stroller, and a jogger. It has a removable pivoting front wheel, and this makes it universal with most bikes. 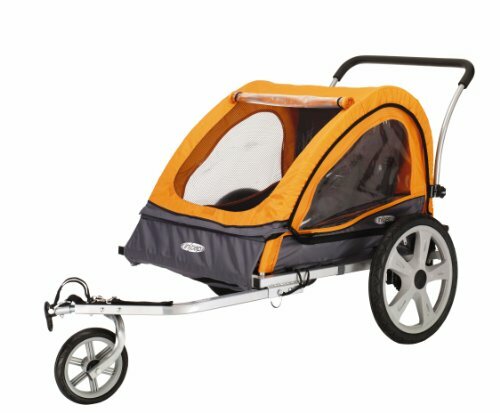 There are also a whole variety of different colors that you can purchase this bike trailer in. You can use this for one or two children to sit in, or you can even use it for storage if you need to. 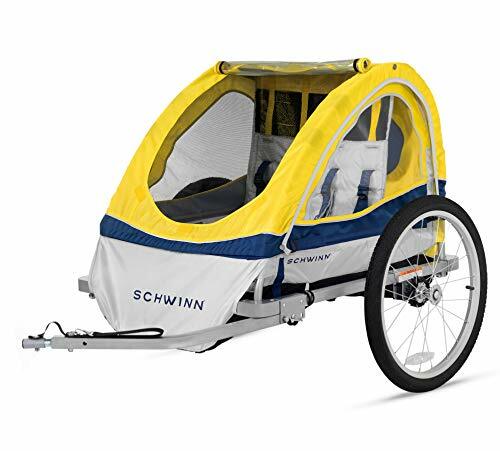 It also comes with a lot of safety designs, as it has reflectors on all four sides of the bike trailer and the trailer will remain upright even if the bike has fallen over, plus, it has two safety belts inside. Why We Liked It – This bike trailer comes in a variety of colors and has such a large amount of safety features, which makes it very secure to use. If your pet doesn’t like public transport or is even too big to go on some of the public transport methods, then you can become quite stuck if you need to get somewhere quickly. 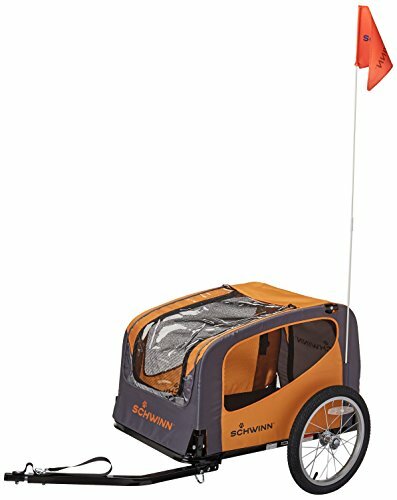 You can safely take your dog somewhere in this bike trailer. It has a folding frame and quick release wheels, so it’s easy to store. It can be attached to any type of bike and has air-filled tires that can be inflated with a standard wheel pump. It has an internal leash that is adjustable and will be able to stop any of your pets from leaning out of the trailer. Why We Liked It – This product is safe for your pet and has a doggy door, which makes it very easy for your pooch to get in and out. 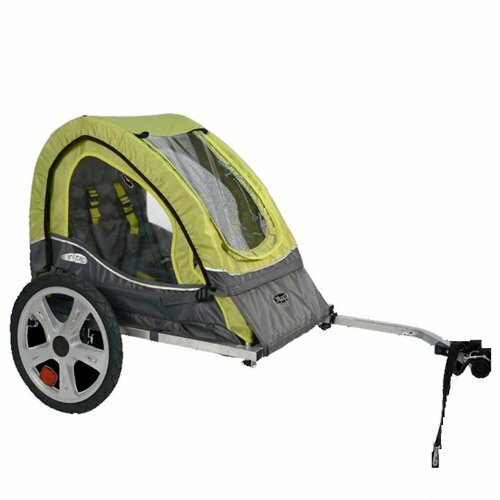 This bike trailer actually has to lock swivel wheels and a full suspension system, and this means that it has the ultimate comfort control. Plus, this bike trailer is also a three in one, because it can work as a stroller, trailer, and a jogger, meaning that it’s very family friendly. It is lightweight as well, so you won’t even feel it on the back of your bike, and it doesn’t make it difficult to push with your child in either. It has smooth rolling 20 inch wheels that will give you a smooth journey even if you go over uneven terrain. Why We Liked It – When your child is riding in the back of this bike trailer, they will barely feel any of the bumps along the way because of the 20-inch wheels. If you want a bike trailer that is able to suit any bike that you might have now or in the future, then this is perfect, this is because it has a universal bike coupler. It has a five-pointer harness that includes shoulder patches as well, plus, it has a safety flag to provide you with extra visibility of the trailer. It has a two in one canopy that has a bug screen and a weather shield. Not only this, but it has a rear ventilation window. Plus, it also has an extra storage compartment at the back of the trailer. 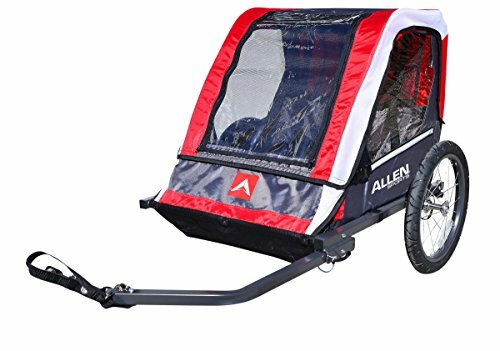 Why We Liked It – This bike trailer has a two in one canopy and has a ventilation window that will also stop any bugs from getting into the trailer. In the list above there is a whole range of different bike trailers that are suitable for many different situations. You will need to know what you want to use your bike trailer for before you buy one, as they don’t tend to be suitable for a whole range of different things. In our buyers guide just below we’ve also discussed the things that you will need to look out for before you do purchase a bike trailer. If you have quite a few bikes, then this feature will be very important because you may not just want to use the bike trailer on one of your bikes, you may want to use it on several different bikes. If this is the case or you think you may change your bike soon then it’s best to get a bike trailer that has a universal coupler. This is because it will then be suitable for any type of bike and you won’t have to purchase a new trailer when you get a new bike. If you want to know if it has this feature, you will need to read the description of the product, and it should say it in there. This is a significant factor that you will need to thoroughly check because each bike trailer in the list above or any other for that matter will have a whole load of different safety features. If the bike trailer is meant to be for children or pets, then it should have a safety harness inside and this is the most essential feature because it will keep them strapped in and safe, so if anything were to happen they wouldn’t be seriously injured. Another safety feature that you may notice some of the trailers have, but some of them don’t is a safety flag for extra visibility. This isn’t essential, but it will help you be able to see the trailer while you’re riding your bike, especially if you’re going to be going out in foggy or misty conditions. There are two different weight aspects that you will need to check about your bike trailer before you buy one. Firstly, you will need to check how much it weighs, as this will indicate how light it is going to be while it’s on the back of your bike. You will probably want to purchase the lightest bike trailer that you can find because you don’t want it to weigh you down while you’re riding. The other weight factor that you will want to check is how much the max weight is on the trailer, and this is very important as it will guide you about what age the trailer is suitable for and how much weight you can put in the trailer. This is not something that you should exceed, because it could damage the bike trailer and it may also make it dangerous to use when you’re on the road cycling, as it may not be able to take the weight. It might sound quite a complicated task, but trust us it’s probably one of the simplest things you will do, and it doesn’t take up too much time either, so you don’t have to spend ages trying to figure out how to attach it. Before you do anything, you will need to first go to your bike and remove the quick release level with a skewer then withdraw the lever, rethread the hitch back through the hole, so it’s on the rear axle of your bike. You will then need to tighten up the nut on the far side and then relock the lever. The trailer hitch should be placed horizontally, once this has been securely attached to your bike the hitch will then stay on your bike. The next step is to attach your trailer to your bike, you will need to line up the toll bar with the line and the hitch. You may find that you have to rearrange the line up of the hitch, so the toll-bar and the hitch line up correctly. Then insert the pin from the bottom and line it up, so it’s in place, then run the safety strap from trailer through the frame of the bike and clip it into the toll bar. You have now installed the bike trailer onto your bike, and you’re ready to ride with it. After you’ve used your bike trailer for quite some time, it’s likely to get dirty, even if you just use it once when the weather outside isn’t that great when it’s expected that it will get dirty. It’s really not very nice if you have a dirt bike trailer and it can actually look quite unattractive. Therefore, it’s best to give it a wash. There are a couple of different ways that you are able to clean it, if it isn’t that dirty, then you can actually use a wet wipe to just wipe off any dirt that may be on it. It’s best to use this method when the dirt is slightly wet still, as it will just instantly wipe off. If the dirt has dried, then you may have to scrub it a little with the wet wipe to get it to come off. If your bike trailer is too dirty to just use a wet wipe on then, you’ll need to get some warm soapy water and a cloth or sponge. Gently wash the trailer with the warm water by wiping the wet sponge or cloth over the material. Once you have done this all the way around the bike trailer, you will then need to wash all of the soap off. To do this it might be easier to use a hosepipe, as it will be much quicker, but if you don’t have one of these, then you can always use a bucket to get rid of any soapy water that may still be on there. To dry the bike trailer, it’s best to leave it open and just let it dry naturally on its own. You will always need to pay attention to the weight that you put into the bike trailer, because if you do put too much weight into the trailer, then it could damage it. Your natural instinct may be to avoid any potholes that you see on your journey, but it’s actually better to go straight over them. This is because if you swerve, it may cause your trailer to tip. Therefore, it’s best if you try and make the trailer wheels go around the pothole so the pothole is directly underneath the trailer and the wheels don’t go near it. There are many different bike trailers all over the internet, and it can be confusing when you have to make a decision about which ones you should actually purchase. It’s important that you do look at each of the features that they have, because some of the trailers may vary in the amount of weight that they can carry. Not only this, but there are also other important factors to check, like the safety features that it comes with. It’s also important that you know what type of things you would like to use your trailer for. This is because most trailers only have a few specific uses, for instance, a pet bike trailer would not also be suitable for a child to use. Therefore you do need to know what you want to use it for. It’s also important that you read our buyers guide as it will tell you what things you need to look out for before you purchase a bike trailer.